An interaction is counted when a visitor clicks, taps or tabs to a field. The value can only be one per field per session - Multiple clicks, taps or tabs are still counted as one interaction if they occur in the same session. A refill count is incremented every time a visitor re-clicks, taps or tabs to a field and changes existing content (.focus(), .keypress()). Value can be more than 1 per session - Multiple re-clicks, taps or tabs to a field and changes to existing content keeps on incrementing the refill value. So for example, 1 Interaction can have 4 refills in the same fields. A blank field count is incremented only when a field is left empty, even though there can be an interaction e.g. only click when the visitor submits the Form. Value can be more than 1 per session - Multiple Form submits of a blank field are all counted - even if done by the same visitor. A fill-in occurs when a visitor enters at least one value, any value, into a given field unique to the session. A drop-off occurs at the first field in the fields sequence that the visitor did not fill in after the last fill in – before abandoning the page, the session ends. So, if one of the fields was skipped, the dropoff occurs at the very last field that was not filled in, not the field that was skipped. If a visitor does not fill in any field in the Form the drop off is shown on the first page step. If the user successfully submits the Form a dropoff is not calculated. 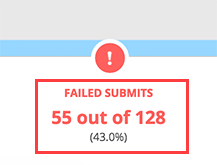 If all fields have been filled in, but the Form is not submitted, successfully or not, a dropoff is calculated on the last field in the sequence just before the submit. In the Hotjar admin, the % is calculated as the total number of times a visitor drops off as a percentage of the total # of sessions ((dropoff/sessions) * 100). A successful submit occurs when the page where the Form is shown returns a message that the Form was successfully submitted. A failed submit occurs when the page where the Form is shown returns a message that the Form failed to submit.